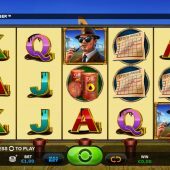 Rich Geyser slot by Plank via Microgaming can you strike it rich? Rich Geyser slot is the second game by Plank Studios to be released via the Microgaming platform, after Neptune Rising. The theme is oil and a play on the term rich geezer as this fellow seems to have struck the black stuff although I daren't tell them the correct term is gusher for an oil well and not geyser! Anyway, the plain reels sit over the Texas oilfields and the sounds are pretty basic when the reels spin and stop. Nextgen's Oil Mania and IGT's discontinued Texas Tea are far better on the eye, but will it be a lucky strike for our bankroll? There are 10 fixed pay lines on Rich Geyser slot and to be fair some high pays which suggests the volatility may be a bit high octane here too. Symbols can appear stacked and the pipe-smoking businessman, unaware of the fire hazard he is, offers the top pay of 100x bet for 5-of-a-kind. Oil Barrels pay 40x, the Stock Report 20x and the five card values 12, 10, 7 and 5x from A down to J. Wilds can appear on all reels and these will award 250x if you saw all 5 on a line. 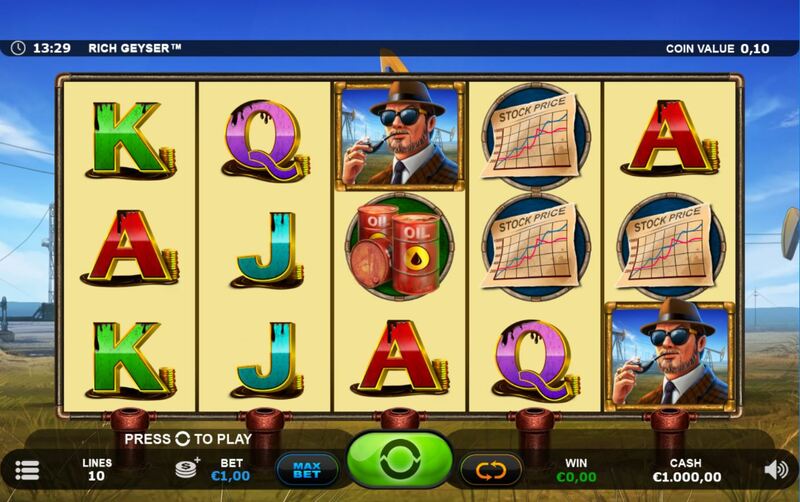 There are no scatters so yet again no free games or bonus as such, which after the lamentable Agent Jane Blonde Returns slot recently may not surprise you. Your only feature is triggered by 2 or more Wilds appearing in view. They will expand down to the oil well heads that are under each reel, so if for example the Wild lands on the top row the oil will gush up making the whole reel Wild, or if on the middle row the bottom 2 positions on the reel Wild. On each respin, the Wild will move one row downwards until it disappears. The respins keep occurring until the grid is clear of all Wilds. That's all folks.